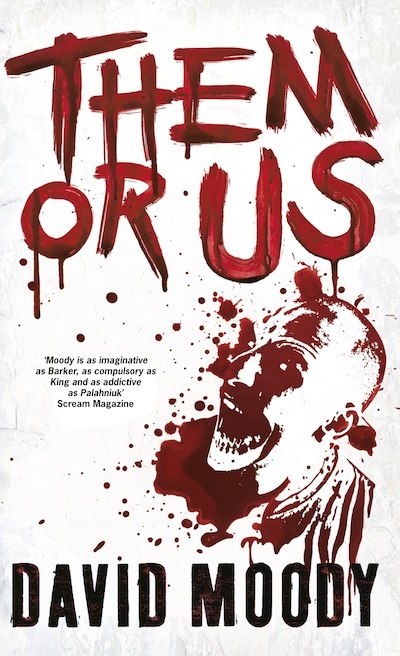 Them or Us is the third book in the Hater series (previous ones being Hater and Dog Blood). Where the first book was the lead up to the apocalypse and the second being the apocalypse itself this one is quite post-apocalyptic. There will be unavoidable spoilers for the previous books as a warning. After a sudden unexplained split in mankind led to people becoming either Unchanged or Haters there was a huge war that led to nuclear bombs being dropped on all the major cities of at least the UK. Despite being fewer in number the Haters emerged victorious with Unchanged hunted to near extinction. Danny McCoyne (anti-hero of the previous books) now finds himself at Lowesoft; the base of a local psychotic warlord named Hinchcliffe who values Danny for his ability to 'hold the Hate' (that is, the ability to resist the urge to instantly slaughter any Unchanged encountered). Soon Danny inadvertently becomes key in the issue of what is to become of the human race. I had been reading Them or Us on and off for nearly a year, initially I didn't really like it, this wasn't because it was badly written (it isn't) or even that it was dull, the reason I didn't initially get on with it was due to how bleak it had become. Hater ended jubilantly, Dog Blood a roller coaster of events, this book kind of feels like the morning after a huge party where you discover you've trashed the house, both in terms of the world being a desolate hell hole, and Danny himself realising the Hate was never a good thing. As is often the case with Moody's books I soon found myself at a point where I just could not put it down, the second half offers small glimpses of hope, the plot begins to escalate again and I was excited to see how it would all end. I've never really liked the character of Danny McCoyne and here he is at his very worst in terms of his role in the world. To me he felt like a horror based Rincewind (a cowardly wizard from the Discworld series) in that he doesn't care about anyone but himself and spends the majority of the book attempting to literally run away from his problems. By the end his character arc is neatly completed with him getting redemption of a kind. Main bad guy Hinchcliffe was a character I loved; a complete psycho but one whose appreciation of Danny leads to some great conversations about his justifications, it was so interesting to really get to know an antagonist rather than them be a flat pantomime villain, Moody even manages to make him seem strangely sympathetic. The previous books in the series felt like strange off shoots of the zombie genre, here with mostly just the one side existing that feeling is almost lost yet does make a reappearance in the last third. It was interesting to have the plot leap forward a bit to show the results of the deadly war between the two sides, the initial few chapters bringing the reader up to date on what has happened between this and the second book were fantastic. Like the first Autumn book (that I also initially didn't love) I feel that a re-read would find me being far more appreciative of the first half as it builds up the world at a sensible pace. Overall Them or Us is another great book in the series with a satisfying end to the character arc of Danny and a neatly open end to the world of Hater. If you have read the others in the series then hardly surprising but this is an essential read regardless of my initial feeling at the books start.